lg | May our skin grow beautiful, as we grow wiser. LG’s make-up brand, CathyCat, will be releasing two new products called Aura Base and Aura Pact. The Aura Base ( 30ml / 27,000 won ) is a make up base that brightens up your tired looking dull skin with the help of crystal pearls. The end results? Enclosed pores and smooth silky skin. 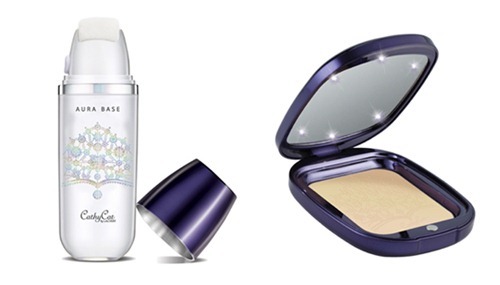 The Aura Pact SPF 30 PA ++ ( 30g / 45,000 won) is a powder pact that contains 6 LED lights on the mirror to give you that superstar face when you look into it ( lol! ). The pact provides protection from UV rays while covering imperfections, even out your skin tone, and makes it perfect ! 시캣 아우라 베이스 ( base ) 캐시캣 아우라 팩트SPF30 (pact) .